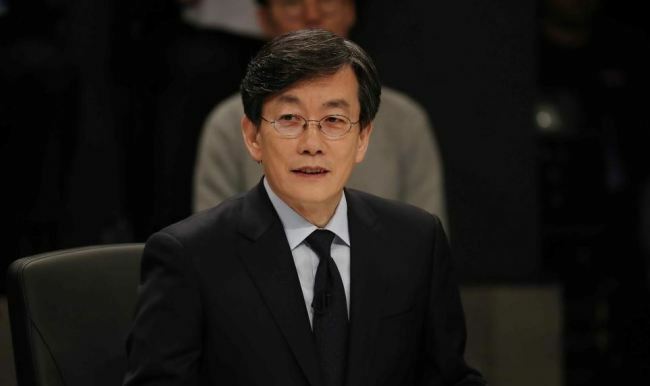 Sohn Suk-hee, the president of cable channel JTBC and a popular news anchor, offered company money to keep a freelance journalist from going public about an assault Sohn allegedly committed, a vernacular newspaper reported Monday. Freelance journalist Kim Woong, 48, filed a complaint with the police last week accusing Sohn, 63, of punching him in the face several times during a dinner meeting in Seoul on Jan. 10. Kim reportedly submitted medical documentation to the police indicating that he required three weeks of treatment as a result of injuries allegedly inflicted by Sohn. The latest revelations about Sohn, a liberal broadcast journalist with at least tens of thousands of fans, are one more episode in a showdown between liberals and conservatives in Korea’s deeply divided politics. Under Sohn, JTBC ignited a nationwide fury in 2016 with a report on the discovery of a tablet PC that it said belonged to Choi Soon-sil, a close associate of former President Park Geun-hye. Some 200 government documents, including Park’s official speeches, were stored on the tablet PC, JTBC reported in October 2016, leading to months of media reports concerning influence-peddling by Choi, who did not hold any official position in the government. Park was removed from office in March 2017. The Dong-A Ilbo reported on Monday that it had obtained text messages exchanged among Sohn, Kim and Kim’s lawyer, surnamed Yang, between Jan. 10 and Jan. 22. The alleged assault took place Jan. 10, and the controversy was first reported in the media Jan. 24. According to the messages unveiled by the Dong-A, Sohn told Yang that Kim had blackmailed him for five months to get a permanent job at JTBC. Instead of suing Kim, however, Sohn offered on Jan. 19 to sign a two-year contract between JTBC and Kim’s firm, which would guarantee Kim’s firm a monthly income of 10 million won, the reported messages showed. Kim had been digging into a 2017 car accident involving Sohn, and had engaged in discussions with Sohn for five months about the possibility of getting a job as a reporter or writer at JTBC. Sohn’s vehicle reportedly hit a tow truck in a vacant lot near a mountainside church at around 10 p.m. on April 16, 2017, as he was backing up. Kim has claimed that a young woman was sitting in the front passenger seat, and Sohn has claimed that it was his mother in her 90s. Some legal experts say Sohn’s actions may constitute breach of trust as he sought to resolve a personal dispute with company money.